Written between 1972 and 1976, a time of high hopes for the rebirth of a national network of regional theatres, these four plays were major building blocks in successfully creating an audience for the new Duke’s Playhouse in Lancaster. 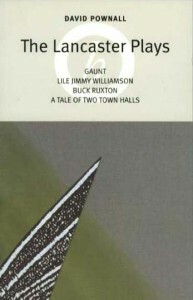 Gaunt and Lile Jimmy Williamson focuses on the myth and reality of power surrounding two local legends; Buck Ruxton is an imperial tragedy of 1936, a notorious double murder by a successful Indian doctor driven mad by the scandal of his Scottish wife’s infidelity. A Tale of Two Town Halls is a political satire, a comedy cartoon on the IMF crisis in the mid-Seventies.